Spring hasn’t quite sprung yet but the odd warm, sunny afternoon reminds me that it’ll soon be summer and that means discarding the jeans and boots and dusting off the cropped trousers and sandals. This means shaving my legs, a chore which fills me with dread every spring. I sat in my shower this morning, balancing the shower head between my knees whilst trying to exfoliate my lower limbs. I’d already dropped the shower head once, sending it whizzing around the cubicle spewing out water all over the walls of the bathroom! Once I’d wrestled that into submission I wedged it between my knees whilst gripping onto the shower stool with my left hand. With my right hand I attempted to hack away at my legs without being able to see what I was doing. Not being able to lift my knees means I can’t twist and turn my legs to get to the hard to reach bits at the back and behind the knees! I’m also terrified of slipping off the stool onto the cubicle floor as there’s not a chance I’d be able to get up again. 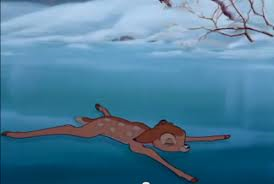 Images of Bambi on the ice spring to mind. Once I’d finished I dragged myself out of the en-suite and collapsed onto the bed to inspect my efforts. Some of it looked good and was actually smooth but I was left with large patches of hair where I’d missed bits. I’d managed to make them look worse than they did before and the whole thing was exhausting! Maintaining a beauty regime once mobility starts going downhill is a constant battle. Luckily I’ve been having my hair done at home since before diagnosis so I don’t have to suffer the horror of staring at myself in a badly lit mirror for 2 hours at a salon! My hair dresser is on maternity leave at the moment though so I had to dye my own hair last week. Not being able to stand up in front of the mirror to do the roots was interesting but I managed to make it look slightly better than it did before I started! I also have a lady who comes round to do my eyebrows and rid my face of the unsightly moustache and beard so that’s another box ticked! What to do about my legs though? I can’t get them waxed as spasms and “disco legs” are sent into overdrive by the hot wax resulting in a kind of involuntary, horizontal “River Dance” while I wince in pain! It’s virtually impossible to get onto the beds too and just the thought of getting undressed and dressed again makes me want to have a lay down! Someone on twitter just recommended hair removal cream which I think I will have to try. It’s either that or long trousers all summer and we all know what effect that can have on heat intolerance! Then there’s the worry of which sandals are best with foot drop but that deserves a whole blog post of its own! Any hints and tips would be gratefully received! ← What a difference a specialist makes …………..